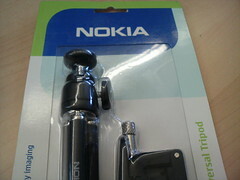 Last week I received the cool DT-22 Tripod from Nokia Blogger Relations. First impressions: a great tool for videoblogging and like Ken wrote, the base is a great little adapter for use with other tripods. Come see the DT-22 this Wednesday at Massive 2007 at the Bryght booth where I will use the DT-22 to videoblog 3 minute videoblogs with show-goers.